To give you an idea of the kind of content featured in The Nightwatchman we’ve pulled together a selection of extracts from our first three years to give you a taster of what you’re missing. Contributors in this selection are: Gideon Haigh, Patrick Neate, James Holland, Saad Shafqat, Christian Ryan, Vaneisa Baksh, Dileep Premachandran, Jon Hotten, Sam Collins, Tanya Aldred and Tom Holland. When we started out three years ago, I wrote the following… it still stands today. The Nightwatchman, with Wisden’s backing, will provide a platform for writers from all over the world to write about cricket- related topics of their choosing. It has no editorial line, no agenda. Whatever their specialist field – and we hope to encourage contributors whom you would not normally find writing about cricket – our writers will be given the freedom to cover the topics they find interesting, to a length the subject matter merits, and in a style of their choosing. All that we ask from our eclectic bunch is that the results of their labours of love are well-written, original and interesting. It is the dearth of long-form writing on cricket – with the notable exception of the Almanack, which increasingly provides independent, quality, considered editorial – that led us to set up The Nightwatchman. We believe that this relative shortage of interesting, original, insightful and in-depth cricket-centric writing is down to lack of opportunity rather than lack of talent, and we are looking to address that. 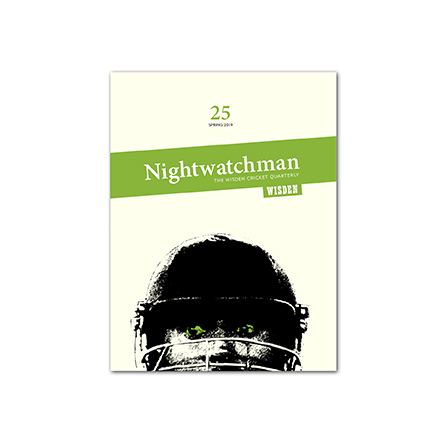 We hope The Nightwatchman will be the place people come to read cricket writing at its very best. Writing will of course endure, but it needs nurturing so that the next generation understands that there is a whole host of interesting things to read beyond a tweet and a blog. The sprawl of the web contains much good (and much bad) cricket writing, and the ability of anyone, anywhere to set themselves up and start broadcasting to the world has brought to light plenty of excellent writers on the game. But the medium is about immediacy, about breaking a story, more than crafting a piece that can be consumed and contemplated at leisure. While technology and the internet have changed the world and the way we view it, it is our belief that the written word, particularly long-form writing, still has its place. We are not railing against the onrushing waves, demanding the digital tide be turned back – we want The Nightwatchman to be accessible wherever you are and whenever you want it, so it will always be available in e-book formats as well as print – but we can’t disguise a love for paper, for the specialness of printed matter. It’s the materiality, the physical connection, the smell, the positioning on – and population of – the bookshelf, the passing down the family line, the inscriptions, the annotations, the knowledge of ownership. The Nightwatchman is open to anyone and everyone – it doesn’t matter if you are a cricket journalist, a historian, a student, a mathematician, a musician, a player or a poet. We’ll look at all submissions (but promise nothing) that fulfil our basic criteria of the pieces being about cricket (however tangential) and being interesting, original and well-written. And we hope that within these pages you will find writing that interests, excites and inspires you.